Perfect place to disconnect from the rest of the world and rest in an unimaginable orchard with exceptional landscapes and trails. 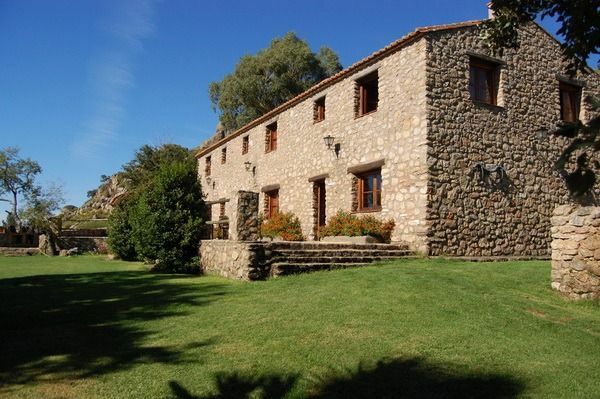 Located in the municipality of Valencia de Alcántara (Cáceres), the Virgen de la Cabeza rural houses are a nucleus made up of 3 houses perfectly adjusted to the traditional architecture of the area, and adapted to the desired tourist use, with a careful design. Three stone houses in a single construction that can communicate with each other on the inside so that they can lodge from 4 to 18 people with total comfort and always totally independent. Each of the houses consists of entrance hall, living room with fireplace and TV, kitchen with all kinds of utensils, two double bedrooms and bathroom. They are perfectly equipped with central heating and hot water. They also have a swimming pool, furnished terrace and garden with barbecue.